A beautiful day, some fiber & silk, two friends and some fun was the perfect way to spend a Friday afternoon on a porch in Cumberland! The result: lots of laughing, lots of strong java, lots of serious business talk, a "little" wine and a way cool scarf! 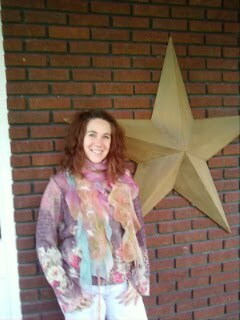 I'm modeling my fabulous Nuno Felted Scarf that we spent about 2 hours making. Takes a little less time if you aren't "yapping" - but what fun would that be?! 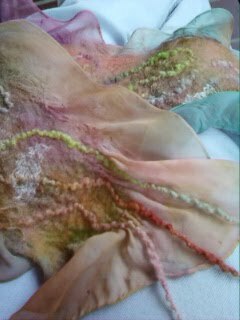 This scarf ended up with so much texture and is made by felting hand dyed merino wool, silk hankie, mohair, wool yarn and glitz onto a hand dyed 90" silk chiffon scarf. The colors were simply gorgeous together. 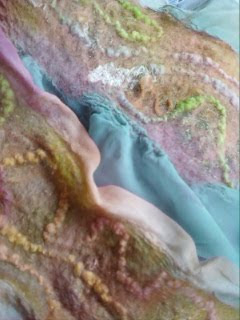 And look how the edges of the chiffon are left to sort of curl. This is the outcome due to the felting process as the wool sinks deeply into the chiffon as you work it while it's wet. It is a fun process and you get a little exercise while making it! 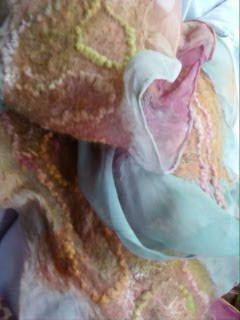 The edges at the bottom of the scarf have wool yarn that extends down past the chiffon to create fringes. I would love to take credit for this gorgeous creation, but it is actually a kit that is created and sold by my friend Dalis Davidson. 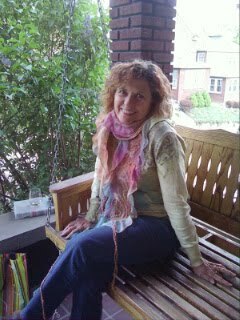 Dalis is as vibrant in her personality as her scarves and other products she creates and sells at http://www.dancingleaffarm.com/. You can buy a premade scarf from her or the kit to make yourself! 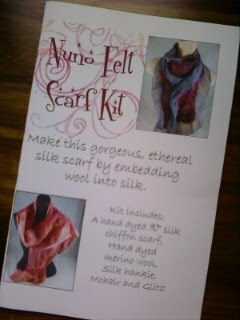 It comes in all sorts of colors and can be made all sorts of ways and even using a shorter scarf. She also teaches this very fun class on making this fabulous neck art. She hand dyes her own scarves and wools at her sheep farm in Barnesville MD and then assembles the kits for sale. Doesn't she look wonderful in MY scarf? !